Ohh my goodness! Fall is here and the thought of sipping on hot apple cider with a dash of fresh nutmeg, watching football, and enjoying the cooler weather makes me want to jump into a pile of freshly raked leaves! But the really awesome thing worth FALLing for is this amazing recipe. I have to admit, I had never tried making a roll before. 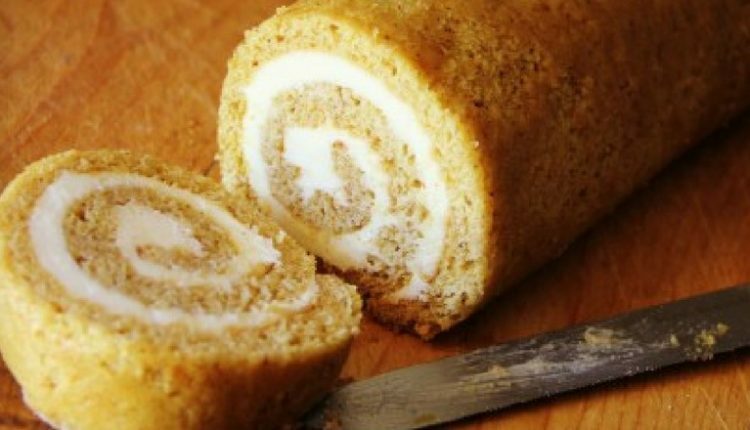 Sure, I would oh and awe over magazines with pictures of pumpkin rolls, but the thought of actually making one seemed like so much work and something that might only be successful in a “test kitchen”. I actually read the directions three times just to make sure I understood what I needed to do. The “Roll up in a powdered sugar tea towel kind of stumped me at first. When I rolled up the cake with the filling and it came out perfect I realized the wisdom in letting it cool like that. Later when I watched a baking show I noticed that several of the contestants just rolled up the cake with the filling after it cooled. Unfortunately, the cake cracked. This method helps you achieve bakery perfection with your very first attempt. This is what Marci says about this dessert recipe. Quick Tip: You can buy canned pumpkin puree or get a little crazy and make your own from fresh baking pumpkins.